Ukrainian Foreign Minister Pavlo Klimkin has said Ukraine is ready to receive any number of international observers from any country but Russia and suggested that "the lid be put on the matter in all the discussions." "I herewith suggest that everyone finally calms down when it comes to official Russian observers for the presidential elections in Ukraine. In early January, I, as it should be, sent a letter to OSCE/ODIHR Director Ms. [Ingibjörg Sólrún] Gísladóttir with an invitation to deploy an [election] observation mission. Inviting observers [to monitor] the presidential elections in Ukraine, I mentioned that the Foreign Ministry would not accept applications from official Russian observers. It would not just be politically wrong but it would contradict ethical principles and the law," Klimkin wrote on his Facebook page on Friday night. He recalled that one day before, on Thursday, February 7, the Verkhovna Rada of Ukraine passed a bill that introduces a ban on the involvement of Russian observers to monitor elections in Ukraine. And prior to that, there were already norms enacted in Ukraine that defined Russia as an aggressor country. "Therefore, I suggest we stop taking into account what they are talking about this in Moscow. After all, this will have no effect, except for air shaking," the minister said. Klimkin said Ukraine is ready to accept any number of international observers, from any country but Russia because it has been carrying out military aggression against Ukraine. "We are ready to provide international observers with all the necessities... In the Ukrainian elections there will be a maximum number of international observers, and there will not be a single observer from the aggressor and occupier country," the Ukrainian foreign minister said. He said a situation in which the aggressor state requires others to comply with the principles of the OSCE is absurd. 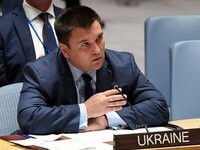 "I'd like to tell everyone that this is absurd when the aggressor country that has violated all the possible international norms and principles, tell us how and who shall comply with the principles of the OSCE, the organization that it has purposefully been destroying," Klimkin said. "So, I suggest we put an end to all the discussions about a sovereign decision of a sovereign state and move on," he said.